I am speechless. As a knitter, I am greatly humbled. This is beyond words!!! Absolutely stunningly beautiful. And inspiring to me as a knitter. wow, this is sooooo amazing! I myself am a knitter, I can see there was a phenomenal amount of work that went in to this creation, great job! What talent! 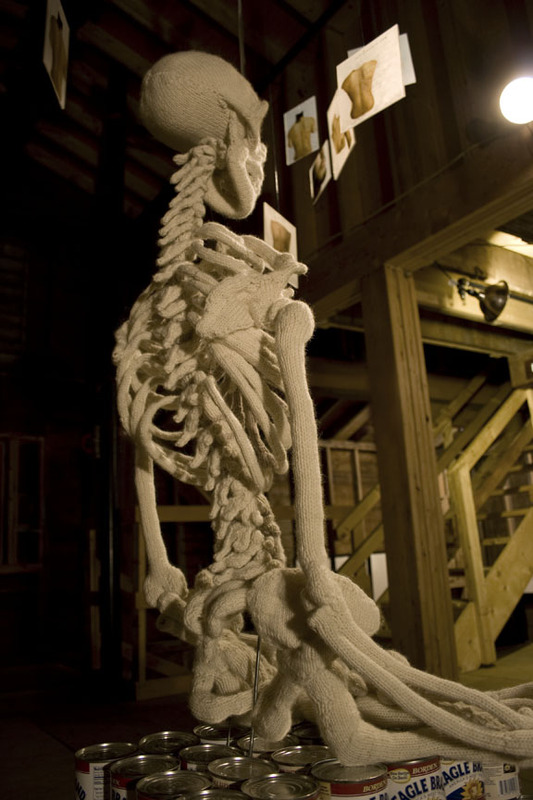 Absolutely amazing knitwork of a skeleton. 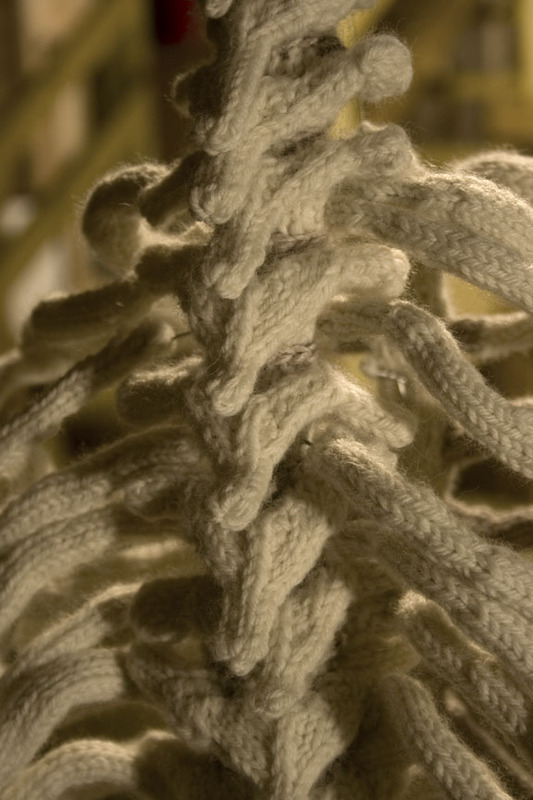 The detail of the hands with the phalanges and the spine and vertebrae are….Well, I used to knit sweaters and etc., but this is a feat that is just unbelievable. What a work of art! I’m drawn to those cervical vertebrae. So impressive! That is master piece, good job ! What an extraordinary installation. A consumate artist! Fantastic, as a knitter and physical therapy student I LOVE it. The details are perfect. Amazing. The detail is incredible. Amazing work! I both knit and am in midstream of studying for an anatomy exam, which both makes me even more in awe of your work. This is SO AMAZING! If you ever think about publishing the pattern I would soooooooooo get it… I’m madly in love with this!!!! WOW! This is an unbeliveable work of art – Kudos to you! Love this and so impressed. I am a knitter and just love to see knitted art. Another knitter here…truly amazing! From this design it wouldn’t be hard to make a sweater like the Irish fisherman knit style, but with a skeleton. Wouldn’t skateboarders love that?! I’m speechless…to say this is inspirational is an understatement. It’s beautiful! Thank you. Beautiful, peaceful and really trascendent. Your message totally gets across, even for a non-artsy person like me. Thanks! i am in awe. this is an awesome endeavor. Live in Boston area would love to see this piece in person. any thoughts of showing here? Hey there, thanks! No plans to show in Boston in the near future, but I’m definitely not opposed to the idea. Amazing. I’m currently in an anatomy class (of sorts) and this is fantastic, I would love this to help me study! 🙂 Good work! Amazing work actually. Thanks Eric. I like your acrylic drawings! Very cool. This is amazing, I can’t even imaging how long it took to create this very interesting piece! Absolutely fantastic! I’m NOT a knitter, but do other needle arts and totally appreciate the masterfulness (mistressfulness?) of this piece! Am sharing it on facebook… Hope you get rich and famous, if you’re not there already! Wow! That is absolutely amazing. Fantastic job. The detailing is amazing and I cannot imagine how much time went into this! Thank you! It took me three months to do the whole installation from start to finish. wow. i have no other words. as a knitter, I bow to you!! Thanks! Feel free to contact me about purchasing the piece if you’d like. I don’t know how I’ve missed this, BUT this piece is AMAZING! If you still have this piece I would love to purchase it, or perhaps purchase your pattern? I am a knitter, and instructor of EMT students. This would be perfect in my classroom! You are very talented! Hi Crysta, I don’t make or use patterns for any of my sculptural work. However, I am thinking about patterning my pieces and releasing them as art books at some point in future. I would so love to have that book. My sister [a crocheter] doesn’t understand the versability of knitting. 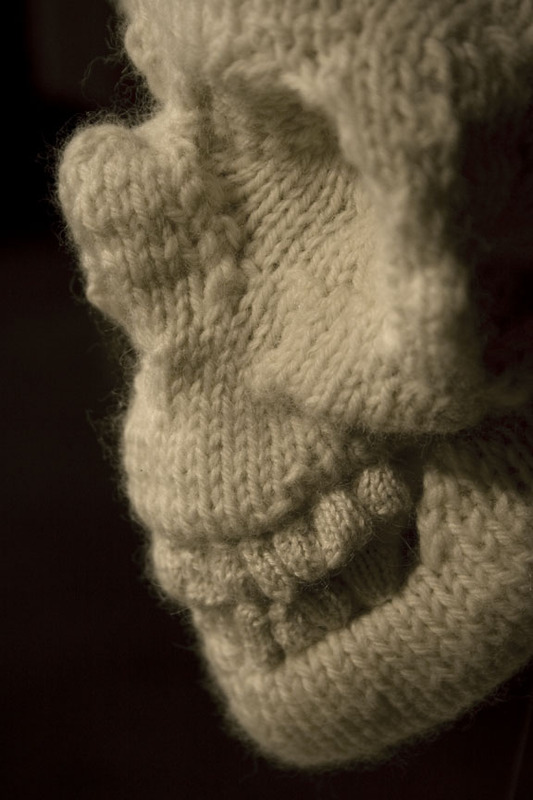 I, myself a knitter, am in love with this skeleton, and if you do pattern it and put it together in a collection for a book I would buy it right away! Yes, actually, the yarn is very soft. I use Cascade 220, which is mostly cotton with some wool blended in so it’s great to touch. Just amazing , a masterpiece of assembly. Is it okay to copy the pictures to show friends? Feel free to copy them to show your friends! However, if anyone wants to reproduce them in a way that would give them money we’d have to talk. Amazing!! As a knitter I can only imagine how much knitting this was, as an xray technologist, it is even more so amazing! Great details!! What about knitting some muscle and skin? Fantastic! I’d love to see this in person. Holy cats this is seriously awesome. Great work! WOW! Are you on Ravelry yet? We knitters – mostly females – know that there are males who knit; we just don’t hear of them often. We can always use more inspiration from the likes of you! Thank you so much. I’ll be sending a link to this to my yoga teacher. Hey, yes I am on Ravelry. My username is benbot. Cheers! So clever. Love it. Happy I got to see it. Absolutely beautiful. The detail in the metatarsals and thoracic vertebrae are particularly pleasing. An amazing tour de force! I’m impressed by both the knitting and the pattern design! I would buy a pattern for this in a heart-beat — I would SO love to knit one myself! (though I’m sure it would take me years to complete). Muito criativo, acredito que quem o fez, e capaz de muito mais. Wow! 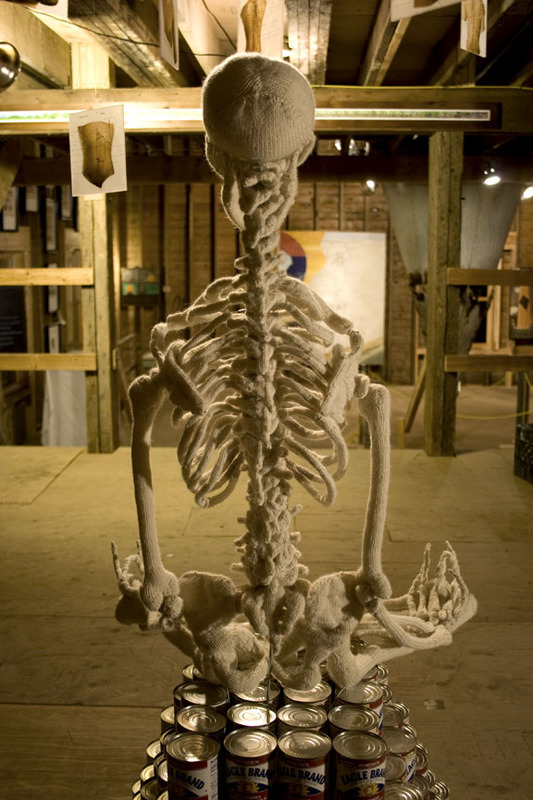 I am bowled over by the anatomically correct skeleton! What an awesome effort! WOW this is beautiful. Not your grandma’s crochet project!!! Amazing talent. WOW This belongs in a museum display. Amazing skill and craft!!! I saw something a week ago or so on a textile piece in a museum. It was pretty absurd and did not show any skill that I could detect. It looked totally random! You’re knitted sculpture is leagues beyond! I am so impressed and wowed! I’m so glad you posted this – what an incredible accomplishment. I’m including you in my Friday Favorites this week on my blog! INCREIBLE!!! genial! para un altar muy especial, ahorita que se acerca el día de muertos! This is a very inspirational piece. Truely beautiful. I’m here via grrl+dog who posted about you on her blog. People like you help make the world an exciting place. How beautiful and relaxed your skeleton looks! I have been knitting for years and have always been fascinated by skeletons having studied anatomy, but I would never have thought of knitting one. Can you bring it to England – Bristol’s fantastic and full of knitters, artists and lovely people who practise yoga! I’d love to bring it to England. Thanks! Yes pleeeeese bring it to England. I would love to see this in the flesh……Well perhaps “flesh” is the wrong word. A bit creepy, but the workmanship is absolutely amazing! Think I dated him once, but hes better looking now! I’ve been studying the details of your piece, and find the knitting very fascinating! I make dollhouse miniatures (1″ = 1′), and also do mini knitting (sz 00000000 needles!) and am very curious about the size of your skeleton. 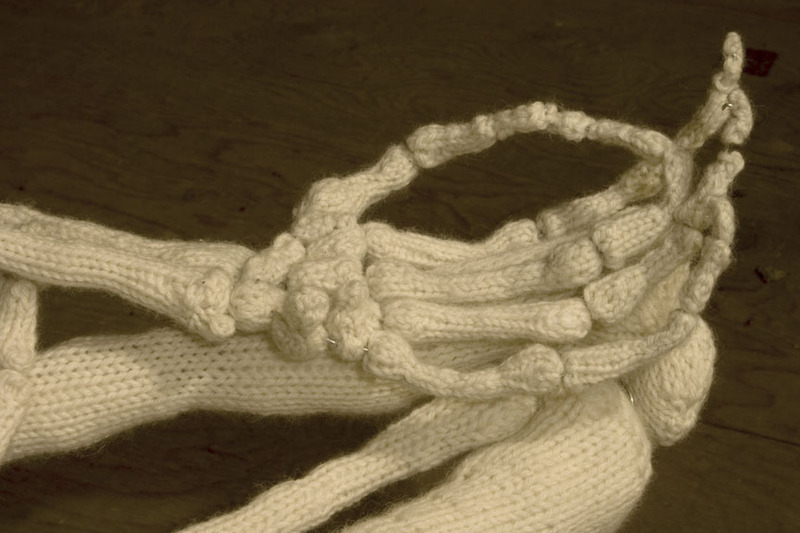 It is so very anatomically correct – and the knitting is obviously done to follow the contours of the ‘bones’ – especially the skull and vertebrae! Do you ‘plan ahead’ with a ‘pattern’ – i.e., a graph – of what each knitted piece should be like, or do you just ‘freehand it’? What size is the skeleton? What size needles and yarn? I can’t imagine trying something like this – but I am fascinated with all the ‘how to’ stuff – just because my mind keeps ‘asking questions’! Wonderful work! The skeleton is life sized, and is roughly the size of my own skeleton. I like to reference my body in my work. I don’t make patterns ahead of time, or while I work…that would come after the fact. When I knit sculptures I always just wing it. As far as needle and yarn size goes, it just takes experimentation. Pingback: theraineysisters » From Susan — Spooky Knitting! Un seul mot “” faboulus”” kiss from Fance!!!! All I can say is WOW!!! A GREAT piece of art! Just when you think you have seen and heard it all. Whoohoo! Simply spectacular or should I say spooktacular! Aw man, this is amazing work. Another “how do you…?” Do you use some sort of frame, knit,stuff, then wire or something else? All power to your needles! Are you a medical student/knit master/artist? You are amazing. I am amazed. I now need to knit a skeleton. I would totally buy a book if it had a pattern for it or even just constructon guidelines. This is really really great. wauw My husband is dokter and i now know what i go to make for his birthday, is this pattern for sale?? Wow! This is absolutely, positively, unbelievably awesome! I’m a new knitter and crocheter and I’m an just in awe, especially with the fact that you’re just winging and experimenting with it. I am an artist as well, and love the whole concept. Bravo! Would definitely buy a book with the pattern for this! Потрясающе! Такая тонкая работа, восхищению нет предела, хотя и жутковато! Обычно крючком легче вязать такие вещи, а здесь спицами! Уважаю! As a knitter and a chiropractor, this is stunning on so many levels! OMG how absolutely amazing! I love your take on the skeleton.. Crystal skulls are sooo last century, it’s all about the knitted skulls now ;o) I have an over whelming urge to try to knit a skull now but fear it will send me around the bend completely! Now I know why I held onto grays anatomy all these years!! Cant wait to see what you create next.. I am in awe and inspired by your fabulous work..
As a crocheter for many years – I am just in jaw-dropping AWE of this. Truly amazing!! I am just realizing one of the things that makes this so awe-inspiring….by focusing such careful detail and attention on each tooth, vertebra, and joint, your work makes us appreciate the true artistry that went into creating US. Not only is your work magnificently detailed and anatomically correct, but it also teaches and inspires us to look at EVERYTHING with new eyes. Bravo! Outstanding & Beautiful Work – My son would love it in his room! I could knit the teeth, but that’s about it. Awesome. I knit but that incredible work of art .Thanks for sharing. Wow this is amazing. Great work. Wow! What an amazing amazing creation. my posts… maybe it would be nice. Hope you enjoy my post. La mama in the lotus position, sitting and guarding her cans of Nestles condensed leche for her little one! Imagine this shown in Mexico hombre! you are genius with the ability to see past the sweaters, scarves, hats, booties, gloves. You see life in all it’s intricacies and and like this incredible piece, we too, will return to our beginnings, but first, just as you’ve done here, you remind us of who we really are. Underneath our clothes, hairstyles, make-up, we are a pile of beautiful bones,and like the creator of the original skeleton, you now create a media which allows us to see beyond, to let all that stuff fall away and show us that we are all alike, to the marrow. I am a beginner (can’t even call myself a knitter yet) and this piece took my breath away; inspired me to weave stories about what it was like living in the barrio and drinking Carnation, Pet, instant milk. (and now I knash my teeth at Nestle). But they fed me….bitter sweet, love, hate relationship. Maria. I am going for my knitting needles right now! Que magnifico eres! I could never do something like that! Those are crazy patterns to follow and would take a very good patience, I don’t think I can do it myself. ): Very wonderful with intricate details..Love it! I have NEVER see anything like this before – really just incredible work! Amazing! What vision it must have taken to create this. Wow. what a beautiful skeleton!! Amazing! I am really intrigued by this piece-such an interesting mixture. I love it and wish you all the best! I’m a knitter and I would NEVER have the kind of ingenuity that would go into a project like this! Kudos to the designer and knitter… WOW! Speechless. What a work of Art!! Stunningly beautiful. As a knitter, I’m nearly speechless. Just LOVE it! Want to make it too! I’m a knit/crochet technical editor and a massage therapist and would love to have one of these in the massage business. Do you have instructions? Or are you thinking of publishing any? I wouldn’t mind proofing the instructions if need be! Thanks Linda! I don’t really make patterns for any of my work. I would be interested in patterning the skeleton and releasing it as an art book one of these days, though that would be a pretty massive undertaking. Absolutely FABULOUS…. I am a collector of skeletons and skulls of various types as well as Victorian oddities… Doctor of archaeology and have seen many skeletons over the years, but none quite as unique as this specimen. I’m a knitter and a doctor- I’m doubly astounded. What an incredible artwork. I am a knitter. And that BLOWS my mind. The different gauges. The teeth. The vertebrae. Bravo. that is a spectacular piece of art. . The vertebrae and hands are my favorite bits…or maybe the cute button nose. Wow! The skeleton is absolutely amazing! Phenomenal! As both a yoga teacher and a longtime knitter I am awestruck! Your work is amazing!! Your work is impressive. I love this piece of art. Thanks for sharing and keep it up! 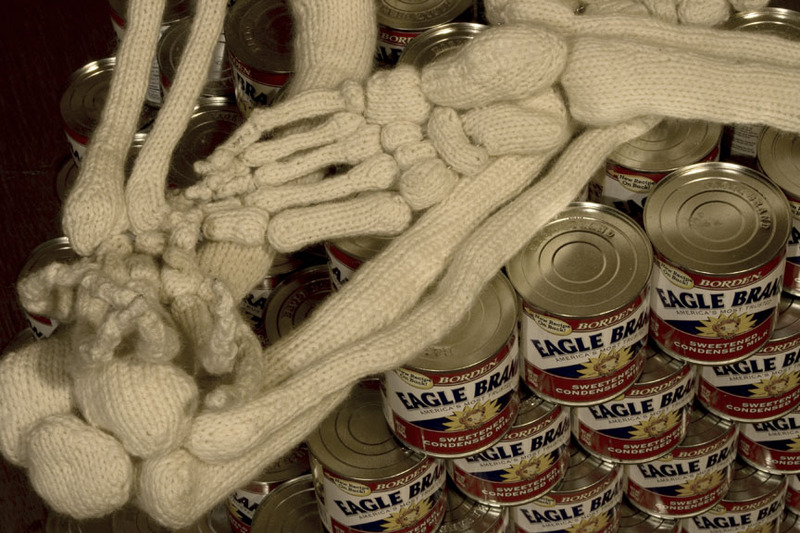 I am dumbfounded as to how the skeleton was actually knitted up. Two knitting needles way, waaaay up! Nope, no CAKD. I didn’t use or make any patterns to create the skeleton (or any of my other pieces). Every bone was made simply by looking at a classroom skeleton and replicating the shapes stitch by stitch. Pingback: Today’s Travels – What Is This I Don’t Even « a sandwich, with words??? this is wonderful ….amazing..and a friend told me look at this ellie not knowing a guy did it..well i dont eva wanna here anyone makin fun of a dude for knitting ect.. cuz i’d like to see them do this! great work! This is amazing. I am truly impressed. I wonder if there is wire supporting the inside of each “bone” so it will be stiff enough to hold up? I would love the pattern for just the HAND!! This is beautiful!!! I can’t wait to see more from this artist! I am trying to work out the meaning, and I’m not sure I get it. 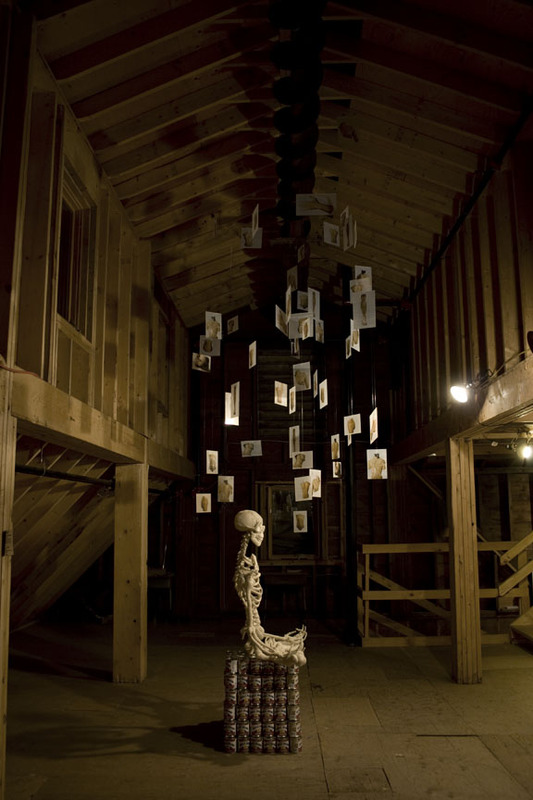 The installation as a whole mystifies me, as a lot of art does. Can you expand a little bit for us? What is the relevance of the milk cans, and why the Lotus position? Thanks for asking. A lot of art (mine in particular, I think) can come across as dense and mystifying. I almost always have my own intent when creating work (which I’ll delve into), but first I’d like to ask you, what do you get out of the piece? What meaning does it have to you? An artist can use any number of references and seek to convey whatever they’re trying to get across; but I feel the interpretation of the viewer (you!) is just as important. For this piece, I chose to install the skeleton in the lotus position in order to speak to the notion of knitting as a meditative practice. I find knitting to be an incredibly soothing act that grounds me in time and space, mind and body. Much like many forms of meditation, it involves repetition and can help to bring greater focus and clarity. I wanted to reference these concepts through the gesture of a knitted human from, yet at the same time, I wanted that human form to harken to the absence of (or freedom from) the body (i.e. the corporeal material that allows us to interact with the physical world). For me the acts of knitting, or making art, or meditating, are all forms of transcendence: all ways in which it is possible to transcend the material (be that our material culture, the material world, or even the very material from which the skeleton was crafted). The title, Transcending the Material, has many meanings on many levels and I invite you as the viewer to meditate on it for yourself. Perhaps you’ll realize something I never even considered. As far as the cans of condensed milk go, that was a very site-specific reference (I’m afraid it doesn’t translate very well to the internet from the locale of the skeleton’s original installation). To understand the cans, keep in mind that I created Transcending the Material while in residence at The Wassaic Project, an arts collective in rural upstate New York. The town of Wassaic is home to the first Borden’s Condensed Milk Factory. I incorporated the cans as a nod to local history; however, I feel it implies a conversation with art history as well (think of Andy Warhol’s Campbell Soup Can paintings and all they conveyed about the materiality of popular culture). Furthermore, the cans serve a structural purpose: they conceal a portion of the skeleton’s support system, while providing a platform for its legs to rest upon. One could see the knitted remnants of this body as being support by the emblems of a certain place, or by the signifiers of our material culture. Awesome…….an amazing project….tib and fib are the wrong way round tho! Ooops…well I didn’t exactly have a doctor on call when i was installing the piece, lol. Thanks for letting me know. My massage therapist wants one. I am humbled at the intritacy of the work. Love your skeleton. You need to publish the pattern. I’d love to knit one for myself. My husband needs to see more than lace shawls and cable sweaters and afghans. 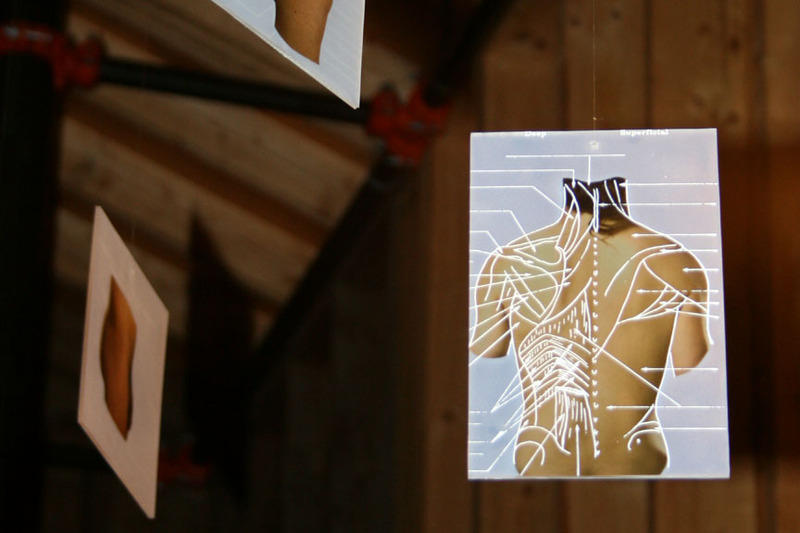 Pingback: Ben Cuevas’s Skeleton @ Knit Culture! All I can say is AMAZING! Awsome job! I don’t suppose you could post a pattern? I’d love to make one. Sorry but I don’t make patterns for my work. You are the daVinci of the knitting world. Just found this and its truly incredible, the amount of detail is astounding! Wow!!! Pingback: Zur Ruhe kommen: alles ablegen, bis auf die Knochen « Indogermanisch. Fantastic! 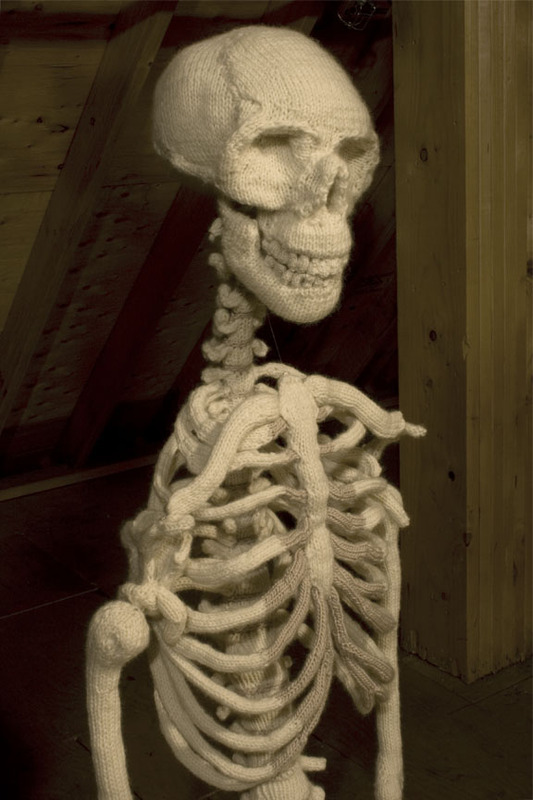 I run an art gallery in Toronto, Canada and we recently had an exhibition of knitted sculpture by Kristin Ledgett of which one piece was a knitted bird skeleton. Beautiful work! Have you considered taking this show on the road? Would love to have it up here. Please take a look at the website or facebook for the gallery to see pictures of the work by Kristin Ledgett we had here recently. Now, if there were a pattern for this most excellent work I would certainly make the attempt! Amazing! Pure genius. WOW. We need the pattern! Wow! Didn’t look like it was knitted. Brilliant. Also, thanks for liking my blog. I have no words. I work in the medical field and this is crazy!!! You have some serious talent. I am so humbled by this pc of art. By the way you are KILLING me that your skeleton is sitting on milk!!! Too creative!! I LOVE IT!!! I apologize for my lack of understanding the piece as a whole. What is obvious and greatly appreciated (that is an understatement. I am truly in awe of the skeleton!) is the hard work, skills, focus, and what definitely expresses passion for art that was necessary to pull off such an incredible creation. speechless!! even im a scice teacher..i stil cant draw da human skull perfectly..thumbs up!! Parabéns que Deus continue capacitando vc que fez esta obra. This is awesome! I will be linking to this from my Blog soon. 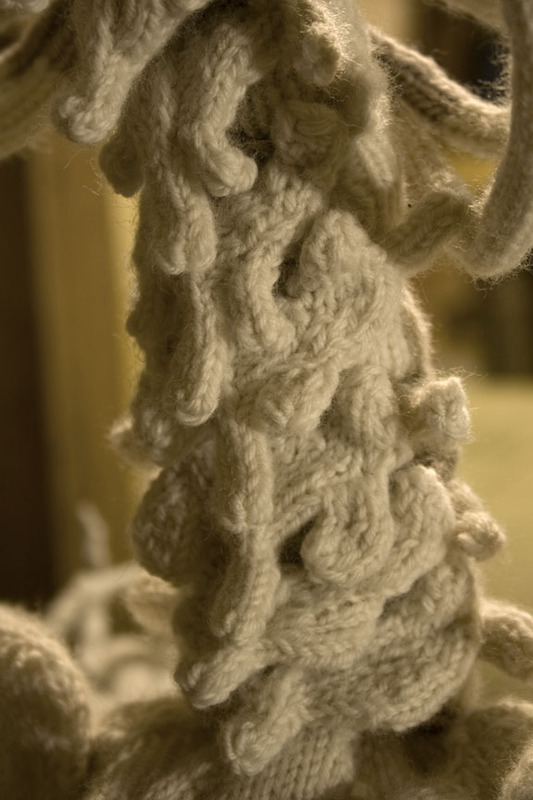 I’m simply mind blown with your attention to detail…..on top of which I adore knitted objects….especially good ones. This, however, is brilliant. Regardless of the fact that I am a knitter this piece is astounding. I love that it is sitting on milk, which helps keep our bones strong and healthy. (maybe not that specific kind of milk but the idea of it still works.) The detail is absolutely beautiful. I am in the minority though. I don’t think you should produce a pattern for this. This is a unique piece of art that you created. Keep it that way! Pingback: The More You Know: Morbid Knits, Eurovision Kitsch, And The Unstoppable Hipster Takeover of Television | hot diggity daffodil! I know it is art but all I can think of is all those DPNs! This is all kinds of awesome!! 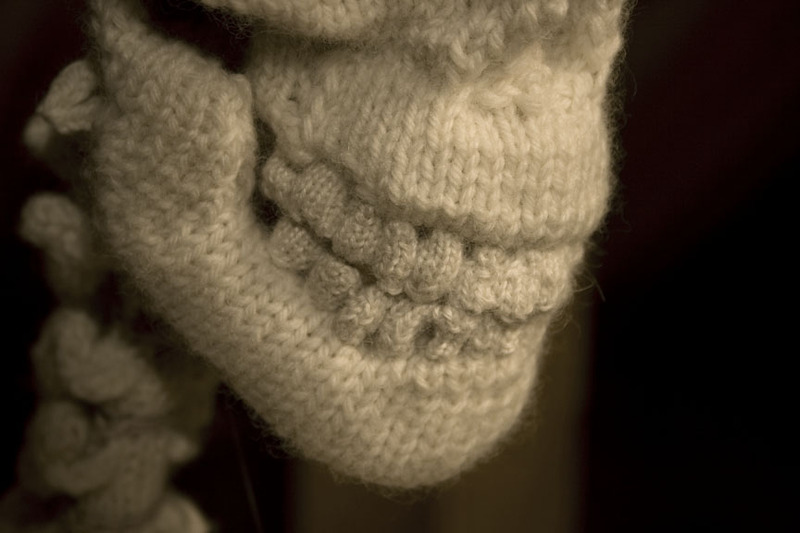 this is so amazing, I love knitting and so admire this skeleton. Do you have a pattern that I could buy? As a biology teacher and a knitter I would be interested in a pattern. Congrats on your work. Much appreciated. Reblogged this on Naturalartist’s Weblog.